The Disney Never Girls embark on a perilous mystery adventure with their fairy friends in an all-new special-edition jacketed hardcover chapter book! 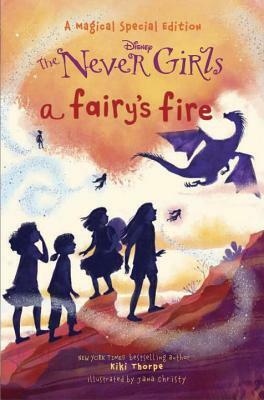 In the next installment of the New York Times bestselling Disney The Never Girls series, Kate, Mia, Lainey, and Gabby are excited to find a new fairy in Never Land—the very first fire talent fairy ever! Tinker Bell, Silvermist, and all their friends are eager to welcome Necia. But when strange fires begin igniting all over Pixie Hollow, everyone wonders if the new fairy’s talent is too dangerous. Or maybe the mysterious blazes have something to do with the dragon tracks Kate, Mia, Lainey, and Gabby discovered? This beautiful jacketed hardcover edition packed with illustrations features an all-new story by author Kiki Thorpe that is perfect for readers ages 6 to 10. • Kate craves adventure and excitement. • Mia loves dresses, roses, and anything beautiful. • Lainey dreams of talking to animals. • Gabby believes in fairies more than anyone. Together, they are The Never Girls—four real girls in a fairy’s world! KIKI THORPE spent much of her childhood reading, daydreaming, and searching for fairies in the forests of Idaho--pastimes that were good training for writing children's books. She is the author of several books for young readers, including the New York Times bestseller In a Blink, the first book in the Never Girls series. She lives with her husband, Greg, and their two children in San Francisco.